Posted on November 28, 2011, in SQL Server and tagged CHECKDB, DBCC, SQL, SQL Server, T-SQL. Bookmark the permalink. 87 Comments. 1) It was only returning the row for the most recent DB, not the most recent for each DB. 2) In the case of one check, the RunDate was not specific enough to get the last/best row. Pam, thank you for your feedback. I changed the code to incorporate your suggestions. IS there a way we can cut and paste this code easily, when I try cutting and pastng the formatting is all screwed up and it can take me an hour to fix the formatting. Or I am doing something wrong ? On the top-right corner of the code block you should see some icons appearing when you hover the code with your mouse. One of the icons is the copy button. You could also download the code from the “Code Repository“. JC, thanks for reporting the error. It’s a strange error message, as the COMMIT/ROLLBACK commands are placed inside an IF block to handle doomed transactions. Does any of your databases report DBCC errors? Can you debug or trace the execution? It turns out that the code didnt like our DBs with bad naming convention that started with numbers (even with quotes). I’ve since renamed and it seems to be working fine. Thanks again. Ha! You’re right. The code did not account for illegal identifiers. Glad I could help. Is the ajusted code reflected above? Yes, the code in this page has been fixed. I have created and run this procedure on 9 different instances of 2005/2008 R2. On every one, it gives me the error “current transaction cannot be committee and cannot support operations that write to the log file”. Any ideas? The error message suggests that you’re running into a ddl error, which results in a doomed transaction. I’m out of office now and can’t check the code. I recently updated the code for SQL server 2012 and the new code might be broken for the older versions. I’ll be back in a few hours. Sorry for the inconvenience. The code has been fixed. Thanks for reporting! Thank you for this from a beginning DBA (who wants to be a Great DBA). How can I test for a corrupted DB.Is there a way I can make a testDB that is corrupted to check the entire process? Thanks spaghettiDBA for the URL to Paul Randal. I will let you know what comes up of all the work to implement this good code. One of the problems that occured is – if a corrupt DB is found, it does not store the results. I tried downloading a corrupt DB from SQLSkills and testing your code against it. Even the home grown script that I had did not work with the corrupt DB, so I was looking at the alternatives. Unless someone has eyes for date (checking it everyday), its hard detect problems. Maybe you want to work it out, or let me know if you need any help. Weird. I tested the code with the “broken” database from SQLSkills and it works just fine for me. Can you post your exact SQLServer version and the exact errors you are getting? Gianlucca, I suggest that the code being used for checkdb be updated to also include running checkdb against tempdb. Tempdb can get corruption and the fix isn’t just to restart SQL Server (you have to delete the tempdb files). So it would be good to know if/when tempdb becomes corrupt. Thanks Jason, that’s a great suggestion! I didn’t think about that, it makes perfect sense. I’ll update the script as soon as possible. Now I wonder how to notify all the people that may be using this script that it has to be fixed. I get quite a lot of hits for this post. Hi I am a fairly new dba. This script was a great help but i have encoutered an error testing it. It then does not send an email. Any suggestions? Hi Dennis, the DemoFatalCorruption2 database contains fatal corruption that raises an error of level 20 and terminates DBCC and also terminates the connection. In this case, you should set up a notification for failed jobs and be notified when the job fails. Thanks for pointing it out. I will code a fix and post it here. Also, I am using the “broken’ db to generate results to be emailed to me but nothing.. I have other job results that are sent to me via email but I can’t get yours to work. I am using a job to send the email like you explained but it seems like I am missing something. Can you explain that section in just a little more detail? Thanks! Thanks for reporting the syntax error, I fixed the code now. My test instances contain the “broken” database from sqlskills and it works for me. I’m using both SQL Server 2008R2 SP2 and SQL Server 2012 SP1. What version are you using? Are you getting any errors? The @dbmail_profile that I was using was totally wrong – Here I thought that it meant to use an operator profile – nope it was as easy as using my dbmail profile name and viola…it worked!!! Shouldn’t this procedure with with Database Mail XPs enabled without having to open additional potential security holes? Don’t know exactly what’s happening here. For some reason your SQL server version is not recognized correctly. Try running the version recognition code and see what’s wrong there. Turns out that the test command from the Microsoft page doesn’t matter. 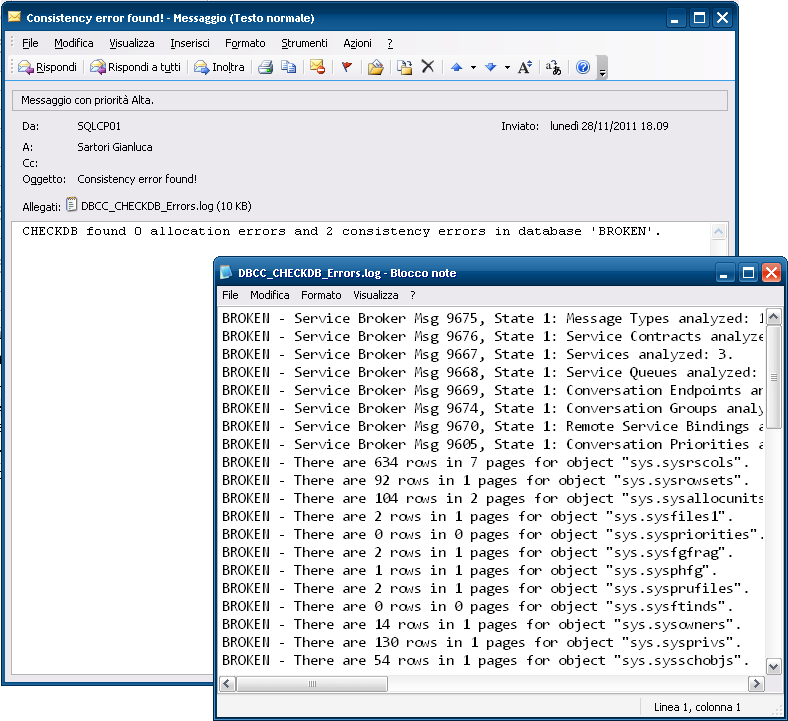 After creating sp_send_cdosysmail I ran dba_runCHECKDB against the demo currupt database from SQL skills nothing happened – until I checked my Outlook junk email folder and found the messages there. After changing my spam settings it is working correctly – thanks! Great! Glad you sorted it out. Does this work on a Log shipped Database ? I created the sproc and executed it on the job with Log Ship Read-Only Database and found that no CHECKDB ran against the database. Have anyone tried this on a Log shipping Standby database ? Appreciate your suggestions..
Weird… works for me. I tried it with a standby database and it gets checked. Which version are you running? Works great now – just one suggestion. How about an option to use the default e-mail profile instead of having to specify one. Then it could be deployed enterprise-wide without having to worry about inconsistent e-mail profile names. That’s a very sensible suggestion, thanks. I just have to make sure I keep backward compatibility. I’ll try to incorporate your suggestion in the next few days. Hi David. You could use the @log_to_table = 1 parameter and query maint.DBCC_CHECKDB_HISTORY to find the outcome of the last execution as shown in the post. Thanks for the advise Gianluca. I’m testing ‘Outcome’. Seems to work nicely. Hi Gianluca, Thank you for the nice script. in the subject line of email alert, include the server (host) name. that way if we have more than 1 server (in our case we have about 30 sql servers) in production, then its easy to find out which server has issues. Thanks for the suggestion. Usually I create the dbmail profile with a fakemail account that mimicks the server name such as server.instance@mydomain and I never thought of adding that piece of info in the subject for this reason. However I agree it’s a sensible improvement and I will try to code it as soon as I can. I always put the server name in the “Display Name” field in the mail account. Then you know for every alert regardless of what generated it. The failure was 29 seconds into the job, which normally takes about 11 minutes to run checkDB on 28 databases. No email was sent. Is the Log file referred to TOOLS.ldf or one of the other DB’s log files? I thought there might be a full hard drive but the drive TOOLS.ldf is on has more then 40GB free, and other drives with transaction log files have 100s of GB free. A few hours later when I got to the office I ran the RunCheckDB command manually and the job completed successfully in the normal time. This morning the job ran successfully as well. What do you make of this? When was the last time a LOG backup was taken? The error is not related to a specific log file, it just says that it ran into a doomed transaction. I can’t say the reason exactly, but it might be an error that cannot be caught by the TRY/CATCH block. I have encountered this error now on my SQL 2012 instances. It works fine on 05 and 08 R2. I have attempted it on multiple instances of 2012. Can you reproduce the error? It would be a good chance to fix the code. I was able to fix this by removing the XACT_ABORT, at the top of the statement. It seem’s to be working as intended now. Interesting. Thanks for the suggestion. I’ll try to figure out what happens and incorporate the fix in the code. Hi and tx for a brilliant piece of work. Can you please add an option to always send mail? This way we have a check if it ran at all. You can set the job up to automatically send an email. That would be the easiest way to get notification. I second Dennis’ suggestion. Add a notification email to a sqlagent operator and you should be fine. I added the ability to exclude databases for my application of it. I had a database that was close to a terabyte. It was killing the process of doing the rest. Thanks Dennis. You may have noticed that I changed the code some time ago to add the ability to include or exclude a particular database from the check. If you want to skip a database, you can simply use the ^ char in front of its name. I have created database email profile and I am getting email that job ran fine but I am not getting any logs attachments. Can some helP? another question I have is does this log file need to be save on a local disk? You won’t get any attachments if no error occurs. If you don’t like that, you can change it. Does it have to be saved on a local disk? Only you can tell. Incorrect syntax near the keyword ‘VALUES’. Is there something that I am doing wrong or was there something that I am missing? Please guide. You’re right: the code could not work on 2005 because of the VALUES in the help section. I changed it to use UNION ALL instead. See if it helps and thank you for pointing it out. Can you please let me know what I am doing is wrong? Sorry to hear it doesn’t work. It works for me. Let me get back to you tomorrow, after I set up a 2005 instance to test it. I am sure I copied the code correctly. Selected the code from this web page and copied to a notepad just to make sure there are no control characters coming through. I compiled and I get the same errors. Are there any settings that need to done for the tools database. I just created a blank database called TOOLS and executed the code provided. Is there a possibility of e-mailing me the code as an attachment in text format? Turns out it was Internet Explorer messing with the code block and adding some tags that should have been hidden instead. I use Chrome normally and it never happened to mangle the code. This is a useful script. Out of the box it runs fine. I did run into two issues when trying to either email myself or log the job to a table. I’m using SQL 2008R2 Latin General Bin collation. For the mail I have updated the stored proc with email profile and recipient (email works fine using the test email feature in sql). I updated the job to use the same profile and recipient. However no email is generated. Also can you procedure both email and log to a table together? I’m sorry the script didn’t work for you. I just tried to both log to table and send the notification email and it worked flawlessly. I don’t know where the error you are seeing comes from. Regarding the email, you will receive a message only when a consistency error is found. You can change that behaviour in the code if you want. Fantastic script and works like a charm for me in SQL Server 2012. However, in SQL Server 2008 R2 I am getting the same issue as Peter D. My collation is SQL_Latin1_General_CP850_BIN2 if you have the opportunity to test. In the 2012 build it is the default collation. You will see that I replied earlier mentioning that I ran in a particular collation (SQL_Latin1_General_CP850_BIN2) and ran into the same issue as Peter. Please feel free to remove as I have discovered the issue. Perhaps you have discovered the same as myself by now –> Some collations are, in fact, CaSe Sensitive. Your script is awesome and to say you need to tighten it up a little bit would be an insult. For those of you using a non-default collation that run into this issue, please take some time to make sure all the cases are the same. You will see there are a couple items whose case does match the whole script: @RowID and @allMessages do come a couple iterations. Jeff, Thanks for the kind words and for pointing out the fixes. I updated the code and it should work now. It’s in point of fact a great and helpful piece of information. I’m satisfied that you simply shared this helpful information with us. However, I have a couple of issues with the computed column “Outcome” in table ##DBCC_OUTPUT. with a blank between the %-wildcard and the 0. Von CHECKDB wurden 0 Zuordnungsfehler und 0 Konsistenzfehler in der XY-Datenbank gefunden. Below I propose a solution which works on SQL Server 2010 (version 11.0.5058). I have not tested it on other versions. Matthias, thanks for your comment. You make really good points and I will address the issues as soon as possible. Thanks a lot for the valuable feedback! just after line #290, which ends the “WHILE @@FETCH_STATUS = 0” loop. I also added the extra space before the first 0 while declaring the Outcome column calculation. Thanks for the script, Gianluca! I would like to start the procedure for certain bases. Nice tool!. Our SQL instance has many databases, and our weekly integrity check may take a very long time (e.g. 40 hours). Any chance to add the associated started time and finished time in the table maint.DBCC_CHECKDB_HISTORY. This may help to identify the bottlenecks. Hey – great script! I am trying to get this to run for a LinkedServer and having little success! I know when you put a NULL entry in for the @dbName it does all databases on the server – however this is not working for LinkedServers! This works – but only on the first database that it returns! Are you able to help in getting this to work with LinkedServers? Your code seems to iterate databases on the remote server, then execute the checkdb procedure on the local server. However, I would simply invoke the procedure on the remote server instead. Hi – that is exactly what it is trying to do . The reason for that is that our Infrastructure mostly has SQL Express (2016) instillation which do not have a SQL Agent to schedule the maintenance tasks for. My idea was to create a Maintenance Instance from a SQL Server Standard instillation and create LinkedServers from that Instance to create a Maintenance Plan against them and for it to iterate through each LinkedServer to run the maintenance. Single SQL Agent to then provide the dbmail alerts if failed/error. Without setting up Scheduled Tasks to execute the code on each SQL Express server I am a little stuck for ideas as to how to complete some maintenance scripts without losing hours doing it manually each day! It works fine on most of our SQL servers, but on some i didn`t get a email. We have about 20 MS SQL express servers,in all versions from 2005 to 2014. Sending a test email with EXEC msdb.dbo.sp_send_dbmail works fine, but the script dosen`t send a email on some servers. If i run the script on a cmd with sqlcmd, the output is diffrent. The script should not send an email unless a consistency error is found. Is this what you’re after? No it should always send an email. Then you need to change the code. As it is now, it sends an email only when an error is found. hmm on 12 of our servers i get a daily mail from a scheduled task, on 8 servers not. All Servers run the same script with the same parameters. Received the same error as someone previously on one database out of eight. Unable to run DBCC on database [databasename]: Check statement aborted. The database could not be checked as a database snapshot could not be created and the database or table could not be locked. After granting Network Service (account sql server runs under as default) modify permission to the database data file location, this is resolved. Correction – I needed to provide modify permission to “nt service\mssqlserver” to teh database data file location.